Selecting the most appropriate cleaning and disinfectant agents is important. The cleanroom manager will need to be confident that the agents will work and are appropriate for the type of cleanroom. Care also needs to be taken as some agents are not compatible with each other. a) The detergent is neutral and a non-ionic solution. b) The detergent should be non-foaming. c) The detergent should be compatible with the disinfectant (that is the residues of the detergent will not inactivate the disinfectant). a) To satisfy GMP regulations, two disinfectants should be used in rotation. While scientifically this may not be necessary, many regulatory agencies expect to see two different disinfectants in place. For this, the two agents selected should have different modes of activity. It may be prudent for one of the disinfectants to be sporicidal. b) The disinfectant should have a wide spectrum of activity. The spectrum of activity refers to the properties of a disinfectant being effective against a wide range of vegetative microorganisms including Gram-negative and Gram-positive bacteria. c) Ideally the disinfectant should have a fairly rapid action. The speed of action depends upon the contact time required for the disinfectant to destroy a microbial population. 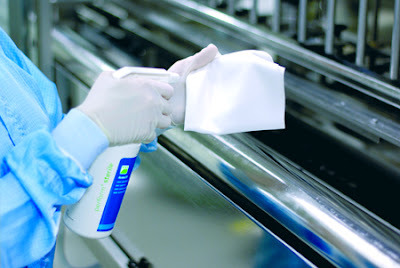 The contact time is the period of contact when the surface to which the disinfectant is applied must remain wet. d) Residues from organic materials or detergent residues should not interfere with the disinfectant. e) Disinfectants used in higher grade cleanrooms (like ISO 14644 classes 5 and 7) must be supplied sterile or be sterile filtered by the cleanroom operators. f) The disinfectant should be able to be used at the temperature at which the cleanroom operates. If a cleanroom is a cold store then it needs to be checked whether the disinfectant will work at that temperature. g) The disinfectant should not damage the material to which it is applied or some other measures should be taken. Many sporicidal disinfectants are chlorine based and will damage material like stainless steel unless the residue is wiped away after use. h) The disinfectant should be safe for operators to use and meet local health and safety laws. i) The disinfectant should be cost effective and be available in the required formats like trigger spray bottles or ready-to-dilute concentrates.